53,3 x 72,3 cm - 20 15/16 x 28 7/16 in. Ernest May, Paris - Vente May, Paris, galerie Georges Petit, 4 juin 1890, n° 75 - Georges May, Paris - Durand-Ruel, Paris janvier 1899 (Stock n° 4990) - Durand-Ruel, New York, janvier 1899 (Stock n° 2117) - H. O. Havemeyer, New York, février 1899 - Mme H. O. Havemeyer, New York, 1907-1929 - New York, Metropolitan Museum, 1929. Paris, 28 avenue de l'Opéra, 1879 (?) (Hors catalogue) (Selon Pickvance in Washington, 1986, p. 264-265, n. 87) - New York, Knoedler & Co., 1915, n° 38 - New York, Metropolitan Museum, 1930, n° 143 - New York, Wildenstein & Co., 1949, n° 36, repr. p. 8 - New York, Metropolitan Museum, 1952-1953, n° 147 - New York, Metropolitan Museum, 1977, n° 18 - Paris, Ottawa, New York, 1988-1989, n° 125, repr. p. 229 (New York seulement). Silvestre, mai 1879, p. 38 - Moore, 1907-1908, repr. p. 141 - Geffroy, 1908, p. 20, repr. p. 18 - Lafond, 1918-1919, II, p. 26 - Alexandre, La Renaissance, octobre 1921, p. 479-481 (repr.) - Jamot, 1924, p. 142-143 - Alexandre, 1929, p. 483, repr. p. 479 - Art News, 15 mars 1930 (repr.) - Burroughs, 1932, p. 144 - Alexandre, L’Art et les Artistes, février 1935, p. 164 (repr.) - Rivière, 1938, repr. p. 131 - Burroughs, The Metropolitan Museum Bulletin, IV, p. 5, janvier 1946, n. face p. 144 - Huth, 1946, p. 239, n° 22 - Lemoisne, 1946-1949, II, n° 498, repr. p. 277 - Browse, , n° 31 - Cabanne, 1957, p. 108 - Havemeyer, 1961, p. 259-260 - Pickvance, 1963, p. 263 - Catalogue peintures françaises , Metropolitan Museum, 1967, p. 76-77 (repr.) - "European Drawings in the Havemeyer Collection", Apollo, novembre 1969 p. 149-155 - Lassaigne, Minervino, 1974, n° 469, repr. p. 108 - Reff, 1976, p. 274, fig. 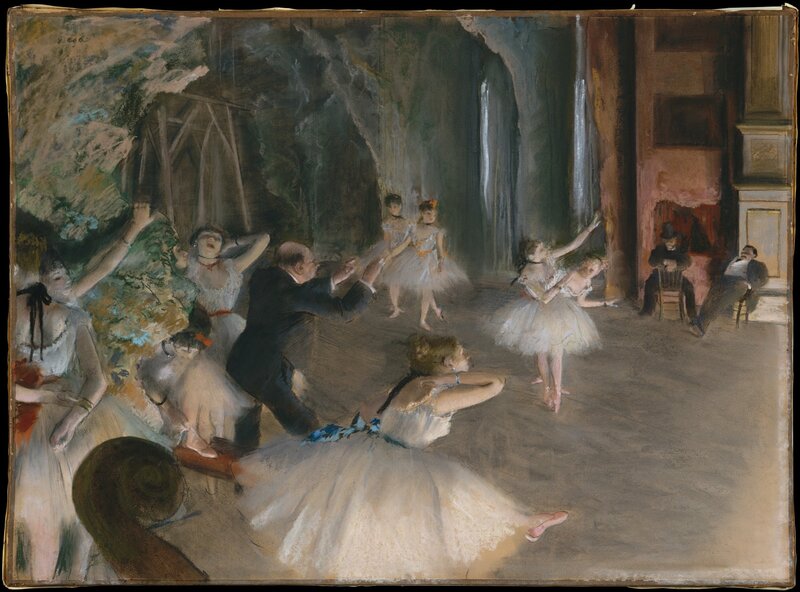 185 - Degas in the Metropolitan Museum, 1977, n° 13 - Reff, 1977, p. (38) sq., fig. 70 - Werner, 1977, n° 4, repr. p. 27 - Moffett, 1979, p. 12, fig. 19 - Moffett, 1985, p. 71 - Weitzenhoffer, 1986, p. 133-134, pl. 93 - Washington, National Gallery, 1986, p. 264-265 n° 87 - Detroit, Philadelphie, 2002-2003, fig. 176, repr. p. 161 - Londres, Washington, 2005-2006, fig. 9, repr. p. 26.